These days, it's rare to find a Star Wars collector who isn't primarily interested in action figures. And the ones who aren't tend to be interested in things like trading cards or comic books -- two other longtime staples of the hobby. Guest blogger Kevin Lentz, however, has found a novel focus. Or maybe it's more of a storybook focus, as he vigorously seeks out items that combine audio and written material. You might remember such "read-along" products from your childhood: they allowed kids to both read and listen to their favorite Star Wars stories. It's a really unique collection, one with an interesting story to tell. So here's Kevin to give this stuff some context. Like most collectors my age, my childhood Star Wars obsession was dominated primarily by action figures. However, I also really loved the read-along books and tapes (I was too modern for records back then). 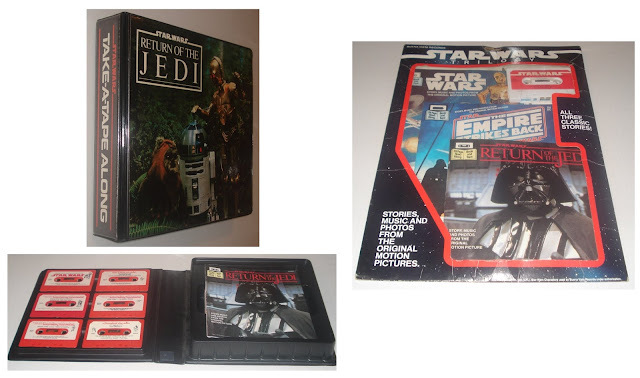 In the days before our house had a VCR, these storybooks and tapes, featuring original music and effects from the movies, were the closest thing my brother and I had to “home video” – these sets were what internalized the stories and characters that went along with our toys. 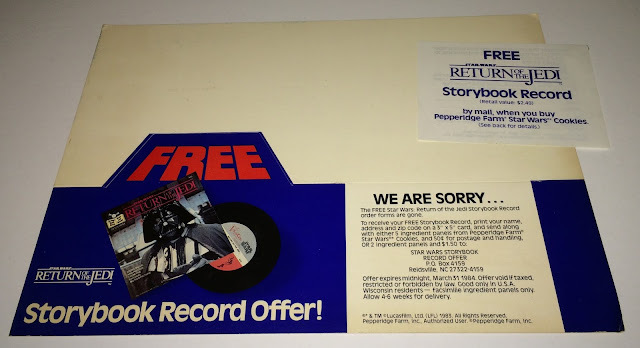 Buena Vista Records, interestingly a Disney subsidiary, had been publishing read-along books with records and tapes since the early 1970s and other story-related records since the 1950s. Their release of the Star Wars read-along in 1979, though, was the first to use photo stills from an actual movie. The premise of the read-along is that a child would follow along in the book as the voice actors on the recording presented the story out loud word-for-word as printed in the text. The child would be cued by a sound (with Star Wars - R2-D2's beep) to turn the page. 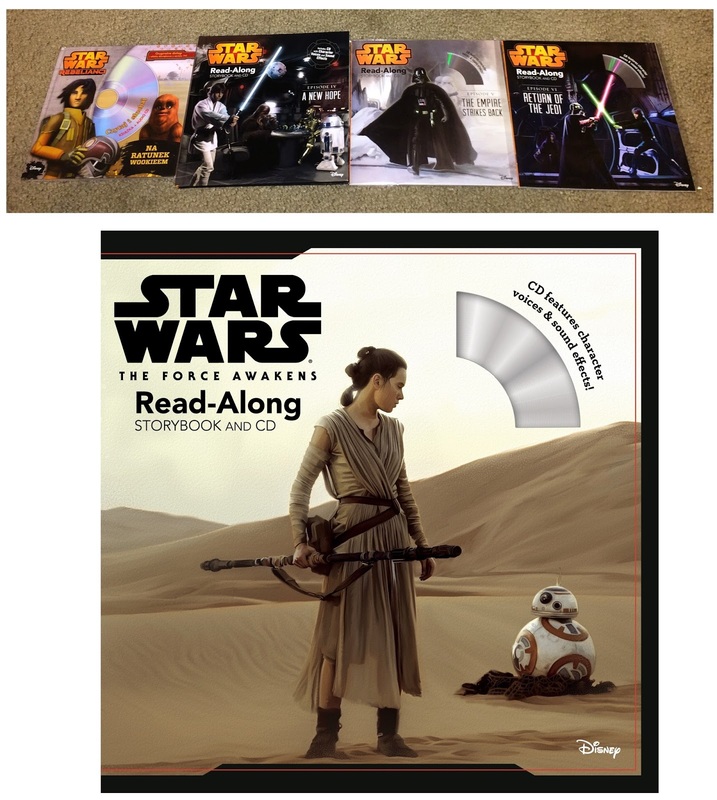 A read-along is different from other audio story formats available for Star Wars (e.g. radio drama and audio book) in that it has an intended educational component – the child, by reading along with the recording, should improve his or her reading ability. While some of the radio drama-style LPs and cassettes came with photo booklets, they did not include word-for-word transcriptions of the text and aren’t included in this discussion of read-alongs. I’ve also excluded electronic reading products that do not follow the read-along format as described above. All of these were released on both cassette and 7-inch record. The first six cassettes can be found with both red and silver headers. It may be that the silver header (Star Wars specific) was eventually phased out and replaced by the red header. The “Colors and Shapes” and “ABC” cassettes were released with Discovery series headers. While the later sets (especially “Battle for Endor”) can be harder to find, a basic U.S. set of tapes and/or records is an achievable and affordable collection. 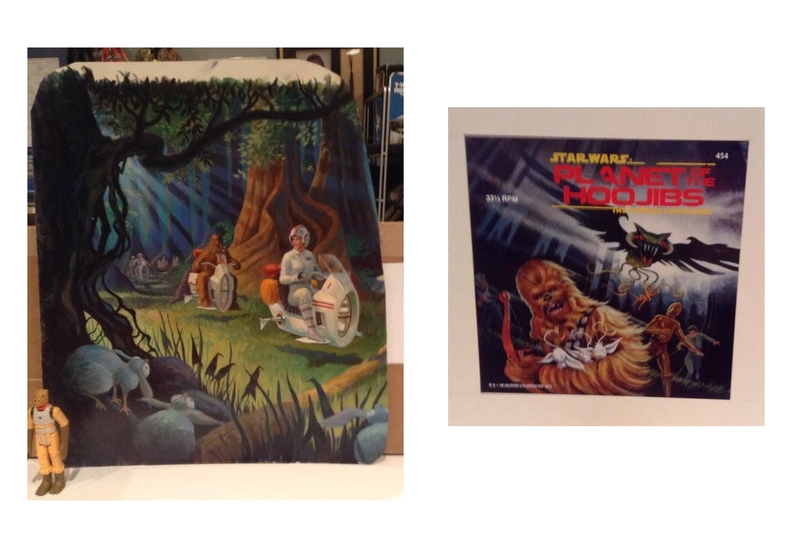 Buena Vista also produced a Star Wars Record Tote featuring the cover from the “Star Wars” read-along. Additional versions of the read-alongs were released in Australia, Canada (English and French), Denmark, France, Germany, Greece, Hong Kong / Singapore / Malaysia, Italy, New Zealand, Norway, Sweden, the U.S. (Spanish), and the U.K. The number of sets released per country varies, and, in some cases, is not entirely known at this time. Below is a table documenting known iterations of the vintage read-alongs. This table only notes basic format releases and does not account for the myriad variations that occur, such as header style, tape color, label style, booklet differences, and label text. It is also a work in progress – I am confident that other editions exist. I’ve only included items I own or have photo verified and would welcome any help filling in gaps. The most common bundle of stories is the Take-a-Tape-Along from Buena Vista -- a set which contains 12 books with the stories on six red cassettes. The assortments shifted over the years. 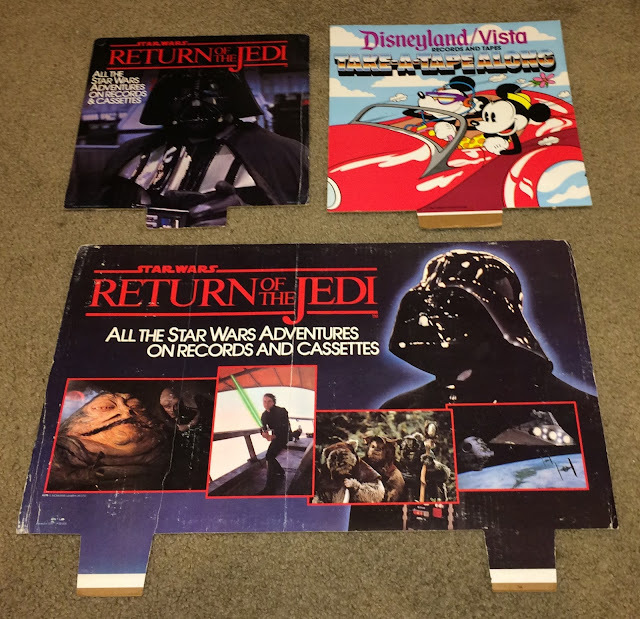 The sets with Star Wars stories also included a mix of Disney and other licensed stories. It’s fun, for example, to find a tape with “Star Wars” on one side and a “Star Trek: The Motion Picture” on the reverse. I imagine there aren’t many pieces of licensed merchandise that pair the two franchises together that closely. Buena Vista also released a set of the trilogy read-along books in a package with the recordings all on one cassette. Various combo sets were available in Canada, Australia, and Hong Kong /Singapore / Malaysia. In 1997, Walt Disney Records released all-new recordings and photo books for the trilogy. They were available in basic and deluxe editions in the U.S. and Canada (including French versions). The deluxe Play Pack editions each included three mini Applause figurines. Basic editions were also released in the U.K. and in Australia. All of the sets from 1994-1997 were available on cassette only. For “The Phantom Menace” in 1999, Kid Rhino released two read-alongs. The movie read-along was available on cassette and CD and was available in a basic edition or with one of four Micro Machines (Gungan Sub, Anakin’s Podracer, Sith Infiltrator, or Flash Speeder). The “Junior Jedi Training Manuel” was available in a basic CD or cassette edition or as a deluxe CD edition. All versions came with an “Official Jedi Knight” patch. 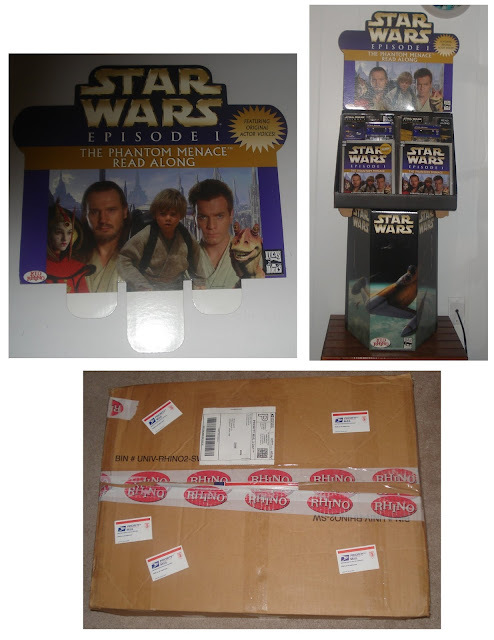 The deluxe version added a purple storage case and a certificate of authenticity. Internationally, the “Phantom Menace” movie read-along was released in France (CD and cassette) and in Poland, Finland, Sweden, Denmark, and Norway (cassette only). 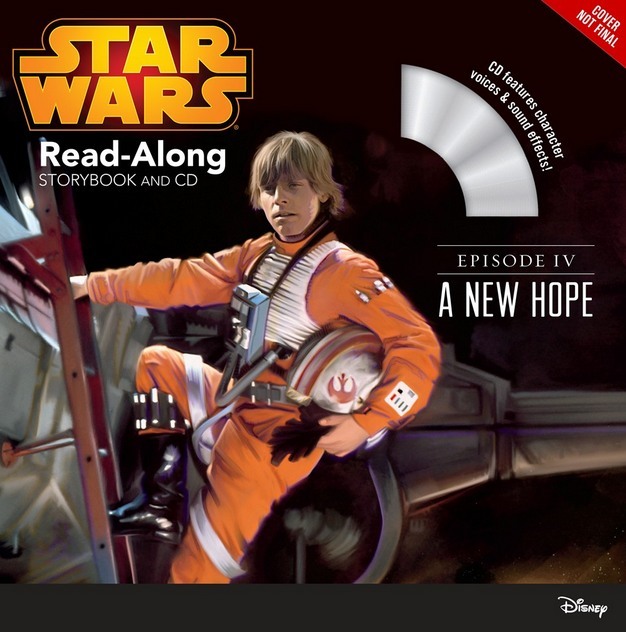 After the Disney acquisition of Star Wars, the read-along series got a proper re-launch, all in CD format. In October 2014, Disney Lucasfilm Press released the first new U.S. set in 15 years: “Ezra’s Wookiee Rescue.” A rerelease of the 1997 trilogy recordings with new artwork from Brian Rood followed in 2015. The read-along for “The Force Awakens” is scheduled for April 5, 2016. A hardcover edition of “A New Hope” was exclusive to Disney Store; a hardcover edition of all three trilogy stories was exclusive to Kohl’s; a hardcover edition of “The Force Awakens” will be exclusive to Target. “Ezra’s Wookiee Rescue” saw a release in Poland. The very first Star Wars read-along may actually date to 1978 with a cassette included with a Pendulum Press teaching kit to accompany a Star Wars movie-based comic for struggling readers. 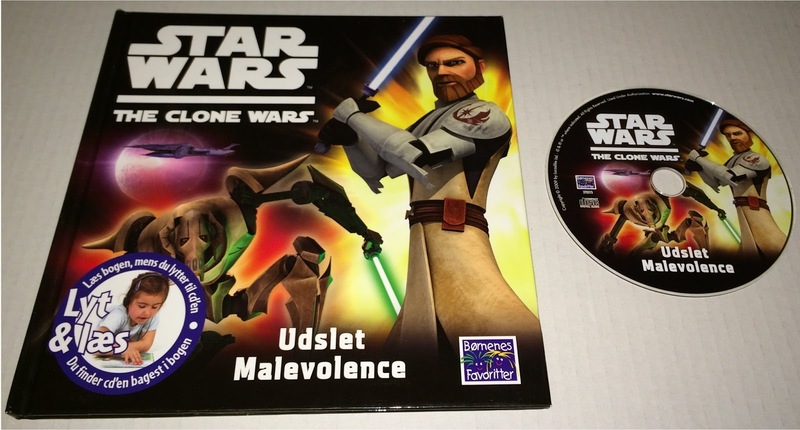 Another outlier is a Danish edition of “The Clone Wars: Destroy Malevolence” with a read-along CD. While a book was released in multiple countries, the read-along edition seems to be unique to Denmark. To my knowledge, not much pre-production work has surfaced for the read-along series. Above are some pictures of color artwork and a proof cover (alternate text color) from “Planet of the Hoojibs.” These items are from the collection of Brad Portnoy, and the pictures are shared here with his permission. Below is an early alternate cover concept for the 2015 “A New Hope” read-along that likely exists in digital form only. Below is a spread from a 1983-1984 Disques Adès dealer catalog that includes the French read-alongs. Below are three Buena Vista bin headers, two for “Return of the Jedi” and one for the Take-a-Tape Along. Below is a shelf talker for a cross promotion with Pepperidge Farm cookies. Below is a header for that same promotion. This item is from the collection of Jonathan McElwain and is shared here with his permission. Star Wars Records and Tapes. Facebook group for discussion of Star Wars on record and tape. The Art of Brian Rood. Artist Brian Rood’s official webpage. Disney’s First Brush with Lucas and the Force: The Story of Star Wars Records. Behind-the-scenes article by producer Jymn Magon. The Music of Star Wars. 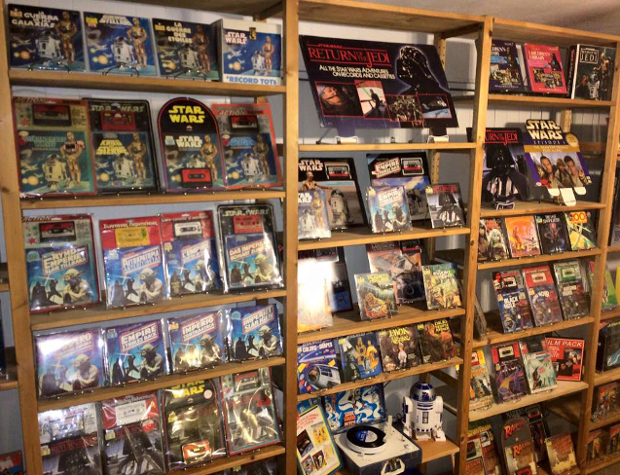 Tony Damata’s collection of Star Wars records and tapes. Read-Along Adventures. A fairly non-active blog with download links for many read-alongs, including all the English Star Wars series. RIAA Star Wars read-along gold record. RIAA Return of the Jedi read-along gold record. Star Wars in the U.K.: Read-Along Adventures. Mark Newbold’s 2013 write-up on the series. “Star Wars” -- the original 1979 “Star Wars” read-along on YouTube. Awesome write up Kevin. I remember read-along's as a kid and even using them in school. They definitely helped me to read. Great collection Kevin. Hello and thanks for the super detailed blog post! I ended up here because I recently picked up a sealed Australian version of the Star Wars ABC read along (with tape) put out by Disney (which was a huge surprise) back in 1984. I couldn't find pictures of it anywhere, are these international version fairly rare? It isn't in mint condition (some bends and discoloration of backing board and the hole for the hook shows a little damage) but definitely sealed and complete. I thought it was a pretty cool find! I tried the facebook group that you linked but got an error- is that still open? Toy Fair 2016: This Year it was Star Wars!